Unity3D is a powerful suite of tools (Project IDE, Code IDE, run-time) for game development. 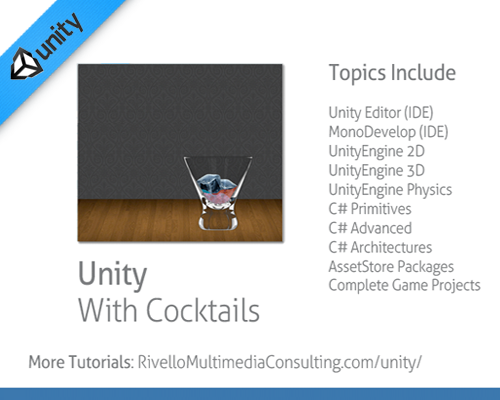 Read the full “Introduction to Unity3D” article and watch the videos below. The videos and source-code are available below this table of contents for all topics marked with [Complete!]. Check back regularly for more videos. 1.5 IDE – MonoDevelop Part 2: Learn advanced IDE techniques and “What’s New In MonoDevelop 4.0”. 2.7 Programming – C# UnityEngine 2D Part 2 – Learn advanced 2D techniques and “Intro To New Native 2D In Unity 4.3″. 4.1 Buy vs Build Theory – When is it best to buy a 3rd party plugin? Enjoy a few videos of free content! Sign-up to view the full video series in ‘Member Resources’ below and to access the complete source-code. Membership is free! Magnificent website. Lots of useful info here. I’m sending it to several friends ans also sharing in delicious. And of course, thanks for your effort! you are in reality a excellent webmaster. The web site loading pace is incredible. It kind of feels that you are doing any unique trick. Furthermore, The contents are masterwork. you have performed a great process on this topic! As it relates to weight training, catabolism is the breakdown of muscle protein in order to provide energy to the cell. The presence on the Y-chromosome within our genes virtually guarantees that. number of doors when looking at careers. For most men, what’s more, it delays climax, allowing the crooks to last longer. the laptop, so the laptop may occur but there is not enough power left to charge battery. for your next course, or just for your love of learning.